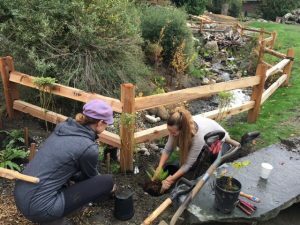 Nestled on the corner of Inglewood Ave. and West 22nd Street in West Vancouver, a long-awaited Outdoor Learning and Community Park has blossomed on the school grounds of Ecole Pauline Johnson Elementary. Over the past few years a dedicated group of parents and educators – the PJ Community Park Committee – have worked tirelessly to help make the dream of this community park come true. To help with these efforts, the committee enlisted Projects in Place Society to help re-imagine the area and King Kubota Services to help construct the parks foundation. Many other groups helped along the way including Atelier Anonymous, Order of Canada recipient Cornelia Hahn Oberlander, and the children and families of EPJ who provided ideas and dreams for what they hoped the park could become for their school and their community. 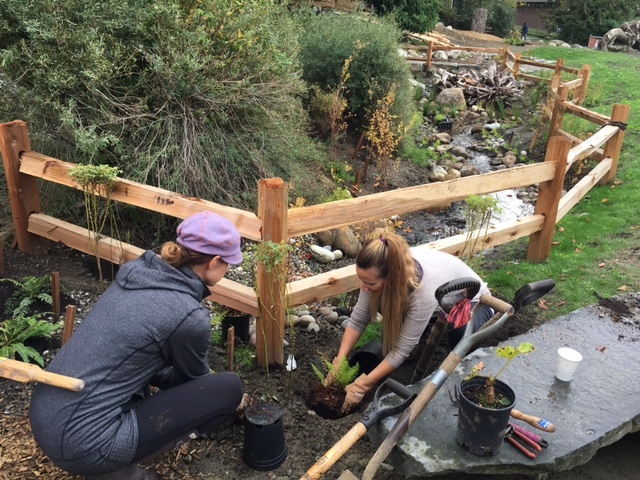 To help improve slope stability and enhance species diversity Devils Club, Ferns and numerous native tree species were planted along and within the parks perimeter. Among other features, a healing circle, water sluice, and outdoor classroom were designed and constructed to service the environment and improve outdoor learning efforts. Two wetlands were constructed to help promote ecosystem growth and interactive learning opportunities. Landscaping efforts were supported and sustained as trees were trimmed, flowers were planted and gardens were tended to. “It is incredibly satisfying to see a project that has been researched, pursued, shaped and lobbied for over four years finally become a reality… and turn out so beautifully! Truly a product of partnerships and team-work, this park has been built because of people like you. To see all the project photos, visit our Facebook page.